Guadeloupe Ports Caraïbes was awarded the European Sea Ports Organisation (ESPO) Award 2017 in recognition of its engagement with the city or wider community, through involvement in art or culture. 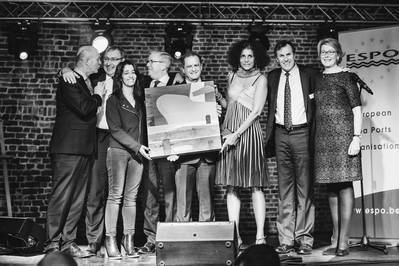 The ESPO Award was handed out by the Chair of the Committee on Transport and Tourism of the European Parliament, MEP Karima Delli, during a ceremony at “La Tentation” in Brussels. - By giving residents the opportunity to visit historic buildings or by turning port facilities into art and cultural venues, we encourage people to come and get to know their port and gain a full sense of ownership of it in a different way. The ESPO Award 2017 saw 13 projects from ports from all over Europe compete for the prize. Guadeloupe Ports Caraïbes beat shortlisted projects from the ports of Antwerp, Brest, Oslo and Venice.